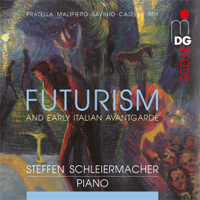 Description: These works date from 1913 to 1924, the biggest piece here being Casella’s 25-minute A notte alta which we already know from his later orchestration of it - a work quite in the mood of Verklärte Nacht but not really “Futurist” in attitude. Italian Futurism glorified violence, war, anarchism and misogyny and called for the destruction of tradition. Malipiero’s preludes suggest Debussy and Ravel so we’re left with the 20 minutes of anarchical explosions offered by Savinio, Pratella and Mix to carry the Futurist banner. Steffen Schleiermacher (1901 “Manfred Bürki” Steinway piano).